As the holidays approach and we start seeing beautifully decorated homes, amazing holiday fashion and talk of festivities galore, I look in the mirror and realized I’ve gotten into my same ponytail rut. Any long time readers know that this is a constant battle of mine and I even went so far as to challenge myself with breaking that hair rut for 31 straight days. I almost got there and what that taught me is that there are many wonderful ways to style our hair without spending an hour doing so. In fact, I am all about a few minutes. 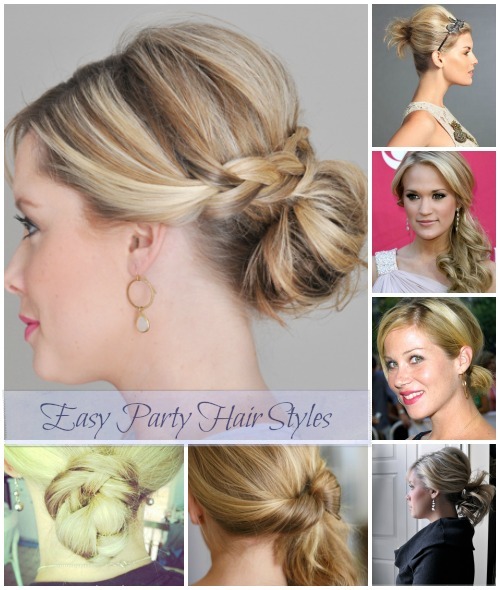 I’ve found some wonderfully easy party hair styles that will get us in the festive mode while still saving time. These easy styles range from just one minutes to ten minutes max. Yes, my kind of hair do. I’ve been a fan of the side ponytail for years. Some may say it’s become my “signature style,” which isn’t always a good thing if done too often. The stars are giving it such a sense of style and elegance, with both short and long hair. I love this versatility because it shows that you can be movie star glamorous without spending hours on your hair. Head over to my post with more about our Side Ponytail Love with a little twist. For my hair, this is the easiest way to make a glamorous statement. 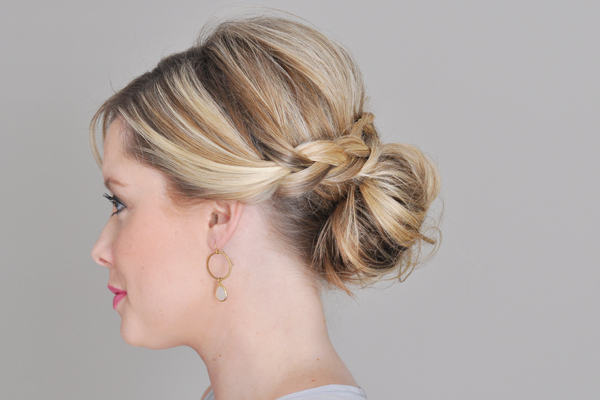 This adorable messy bun with braided wrap by Kate is great for many hair lengths. Kate is the master of easy styles and her tutorials are fabulous. One thing I’ve realized over the years is that sweeping hair away from your face is a great way to look 10 years younger. When you pull the hair away from the face, it exposes your facial features giving wonderful definition. To add a small side braid, start at the temple and incorporate this into the ponytail. It adds a fun, youthful detail. This will also gently pull the eye area back, giving you an instant eye lift! Too often, I just pull my ponytail low around the nape of my neck. When I realized how incredibly easy it was to braid it, then wrap it, I was thrilled at the more elegant look it created in under a minute. See full post here. I shared a video tutorial on just how easy this half braid is to accomplish. 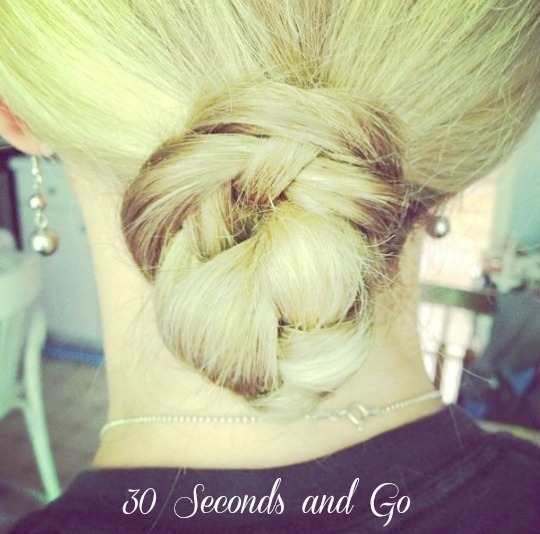 I love this because you don’t have to have long hair to do this simple twist and it can be done anywhere. My daughter loves a small braid at the top of her head and it worked even with shorter hair. How elegant is this. Again, I love a twist to pulling hair low at the nape of the neck. Full Tutorial of Twisted Bun at Freckled Fox. Very similar to the Chignon, you can see my post on how this inverted ponytail is a daily favorite for getting out of the ponytail rut. This 5 Strand Braid is stunning. She used clip on hair extension to create this amazing look. What a great way to add versatility to shorter hair. Again, Kate shows so many versatile styles for hair of all lengths. 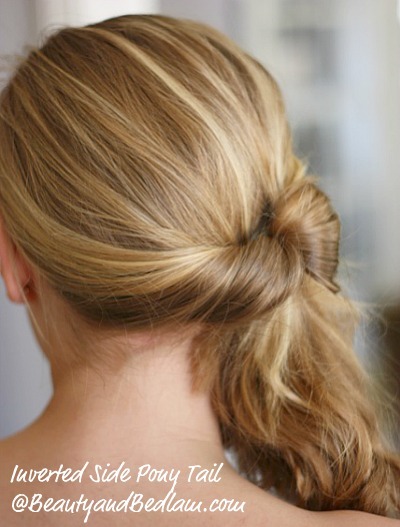 This is an elegant pony tail for shorter hair. Adding height on top is important in giving any hair style that extra festive touch. Who says shorter hair can’t pack a punch with a fabulous updo? This shows the power of hair accessories, even for shorter styles. Are these ideas getting your creative juices flowing? Since I’ve played around with the length of my hair just a bit over the last few years, I’ve realized that while a shorter bob may be sassy and fun looking, I just can’t part with the ease of longer hair. I see my friends with their cute short hair and am tempted, but then the reality of styling it sets in. Last year when it got cut, my only requirement was that I be able to pull it back, but when she was done, the layers were a bit too short. I was lost for a month or two. 😉 I’m slowly growing it back, but my hair just isn’t as healthy as it used to be when I was younger. When Hairfinity approached me about partnering with them, I went straight to my unbiased hair dresser (a new one, not the one who chopped my hair.) Hairfinity states that it’s a natural vitamin complex that restores those missing nutrients to encourage hair growth and make hair shinier, thicker and longer. I appreciated the fact that they were working from the inside out and not just a topical type of treatment. I shared the active ingredients with my hairdresser and she mentioned that many of her clients were having great success with supplements like this and she was quite impressed with the difference in their hair. That’s all I needed to hear to give it a shot. I’ve been using Hairfinity for about a month and definitely can tell that I’m not shedding nearly as much. It’s definitely feeling healthier, but I need to give it another month or so to tell you about its growth. 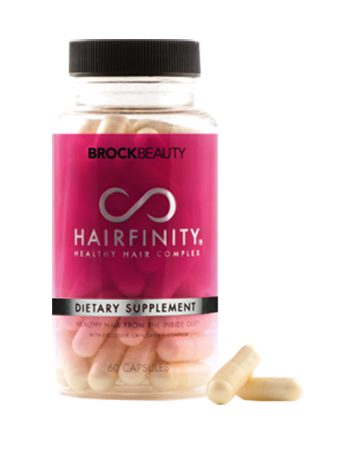 To be very specific, Hairfinity is a nutritional supplement formulated with essential nutrients for healthy hair. This hair specific formula contains Vitamins A, C, and D, a B-Vitamin Complex, Biotin, MSM, and more. 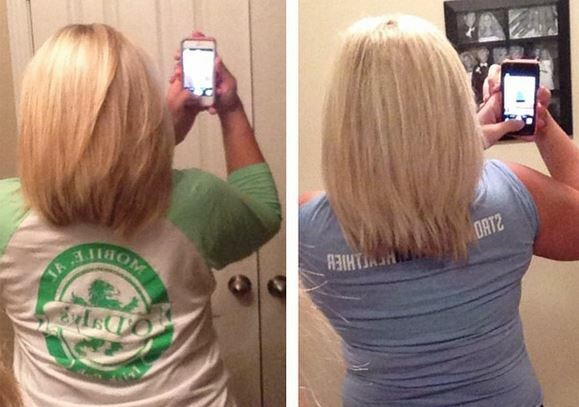 Hairfinity is clinically proven to increase the hair growth rate by 155% while decreasing shedding. Two capsules are taken per day, and each bottle contains a one-month supply. Since I do invest in vitamins and supplements as part of my everyday routine, I knew this could only be helpful and I’m excited to stick with it. So let’s get back to easy hair styles. What are you finding helps to break that monotony with your hair? Any great ideas because I would LOVE to hear them.